These Morning Glory Muffins remind me of my mom, because when I was little she used to say, "Morning glory" as a "good morning" type of greeting. I also remember I really liked these muffins, jam-packed with ingredients, as a teen. Still do. Recently I started thinking about these muffins again. And I wondered where the original Morning Glory Muffin recipe came from. The now-famous muffin was created by chef Pam McKinstry when she owned Nantucket's Morning Glory Café. Chef Pam's Morning Glory Muffin recipe was published in Gourmet magazine in 1981 and became quite popular. 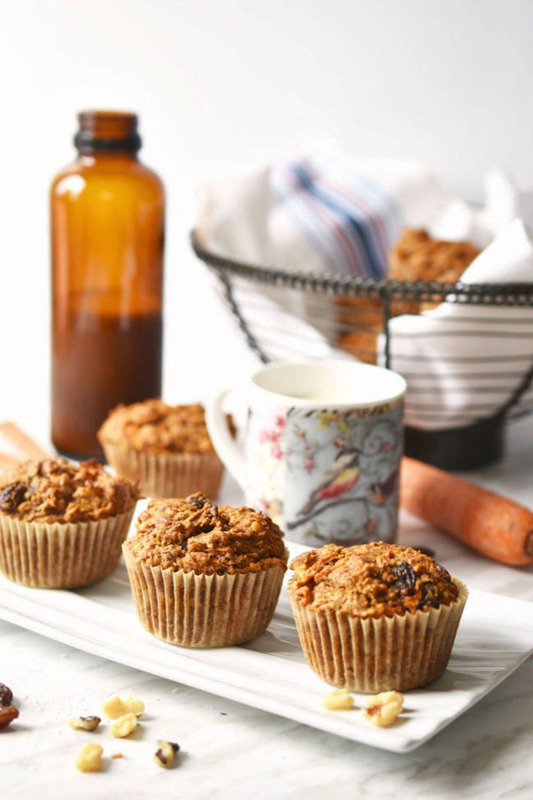 Morning Glory Muffins are packed with ingredients - like carrots, raisins, apples, coconut and walnuts. They offer the spicy, warming taste of cinnamon. They are fittingly glorious to eat in the morning - pleasantly tasty with filling, nutrient-dense ingredients. 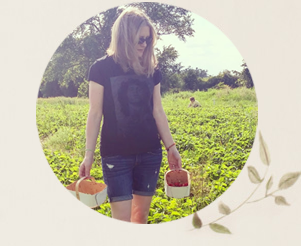 A morning glory is also "a climbing plant often cultivated for its showy trumpet-shaped flowers, which typically open in the early morning and wither by midday." I certainly feel like I'm withering by midday, I know that. I also read a gross interpretation of morning glory on Urban Dictionary, but let's not go there when we're discussing food. My vegan version of the Morning Glory Muffin uses whole spelt flour rather than whole wheat flour. I have omitted the grated apples in favour of apple juice. (I'd rather let the carrots shine.) And I replaced the usual eggs with flax "eggs." 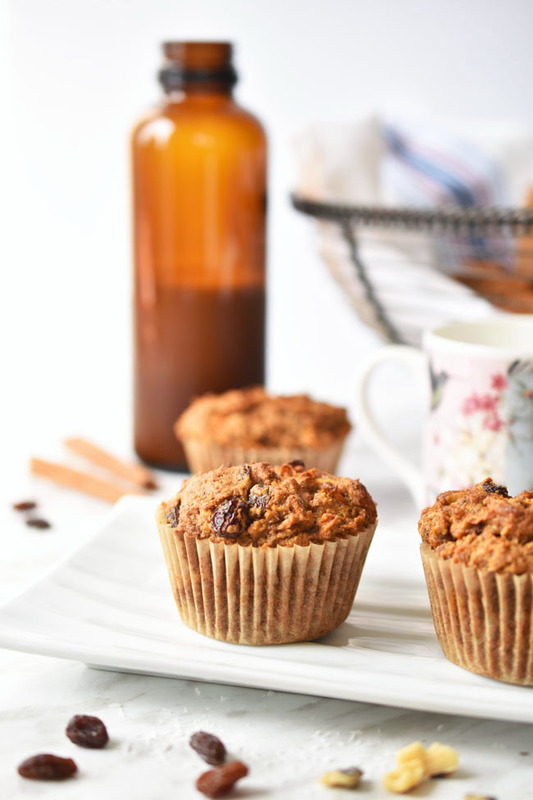 The recipe results in a tender, moist muffin with the lovely crunch of walnuts and familiar taste of cinnamon. And then there are those chewy sweet raisins! Yum. I used coconut palm sugar rather than cane sugar. Coconut sugar is made from extracting the sap of the coconut palm and then boiling and dehydrating it. As Dr. Weil explains in this article, it has the same number of calories and carbohydrates as regular cane sugar, but has only three percent to nine percent each of fructose and glucose. 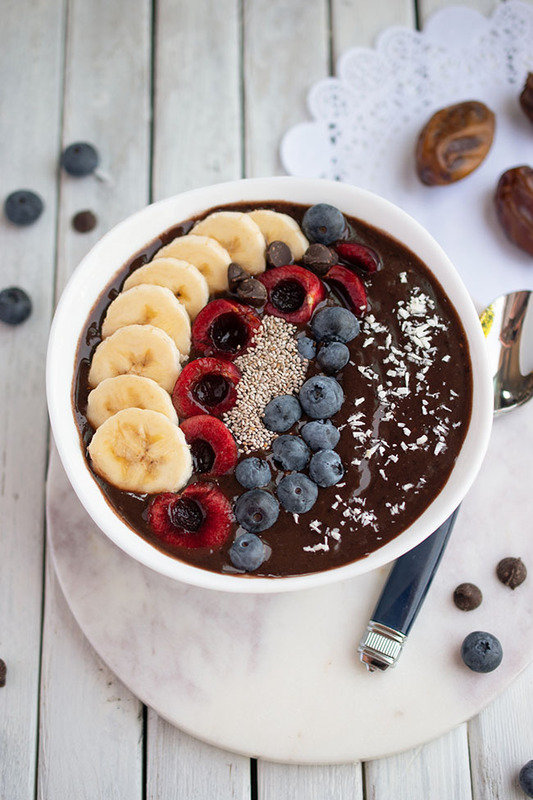 "This is an advantage, because you want to keep your consumption of fructose as low as possible, and cane sugar is 50 percent fructose," Dr. Weil explains. Not that he recommends eating much of any type of sugar, of course. I tend to use coconut palm sugar as a replacement for brown sugar. 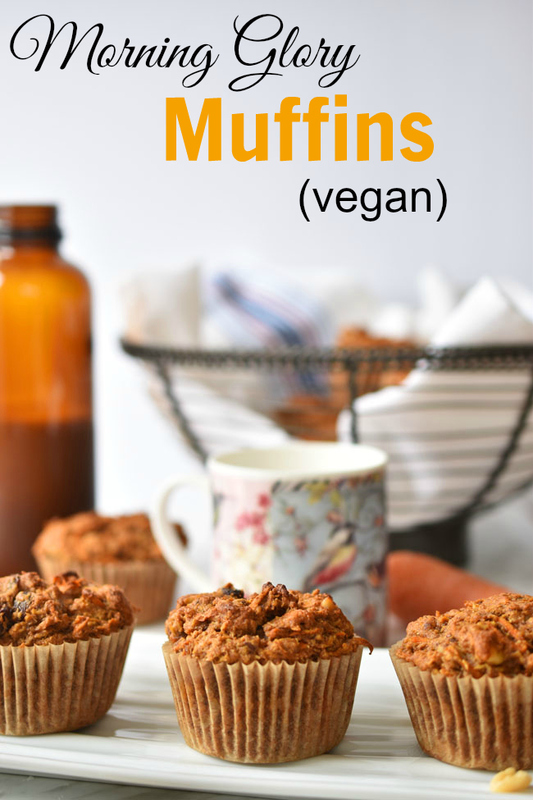 These muffins are simple to make, however I recommend getting all your ingredients ready before you start. Grate the carrots in your food processor for ease and convenience. Put your raisins to soak and make up your flax "eggs." It's all super easy after that. 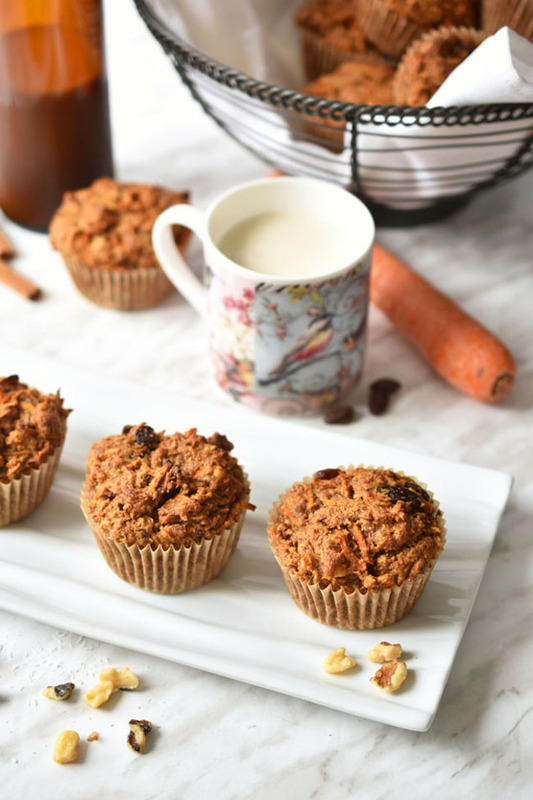 These vegan Morning Glory Muffins are hearty, healthy and filling. Great for grabbing on the run in the morning. This recipe makes 12 to 16 big muffins. I recommend wrapping any extras individually in plastic wrap and putting them in the freezer. They'll be handy to grab when you're heading to work in the morning. 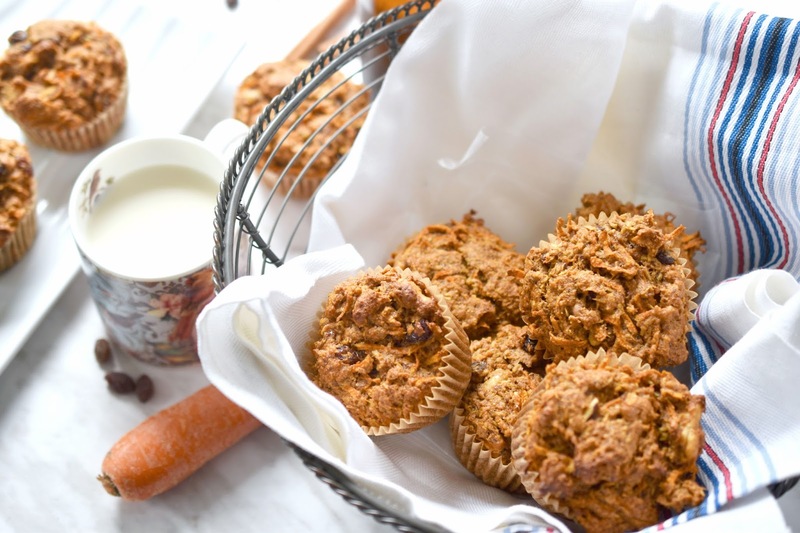 Have you had Morning Glory Muffins before? 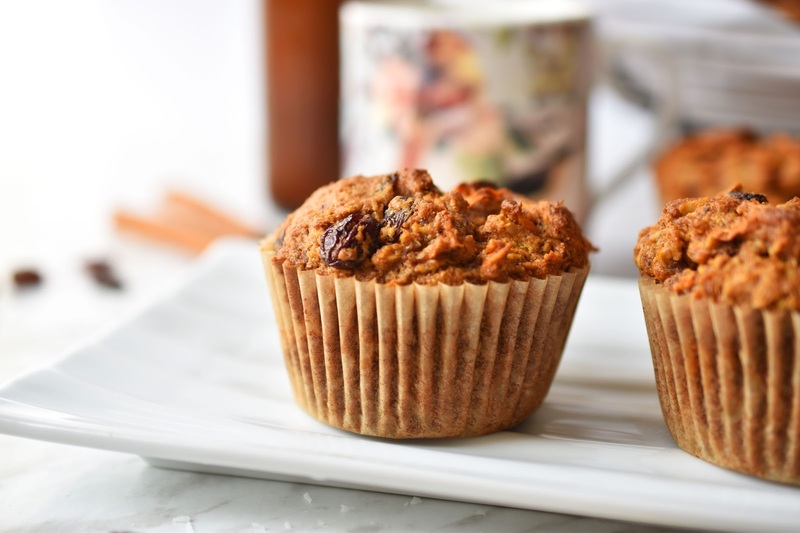 Do you like your muffins jam-packed with ingredients or more plain? Preheat oven to 375°F. Line a muffin tin with paper liners or spray with cooking spray. In a large bowl, stir together dry ingredients from flour to walnuts. In another large bowl, stir together remaining ingredients. Fold wet ingredients into dry ingredients and stir just until combined. Fill muffin cups to the top (or slightly above) with batter. If you have extra batter, make a few mini muffins. Bake for 20 to 25 minutes until a toothpick inserted in the centre of the highest muffin comes out clean. Another delicious recipe! Those muffins look so good that I want to have one right now after lunch. :o) Never heard about them before.